Someone started crawling last week. I mean REALLY crawling. 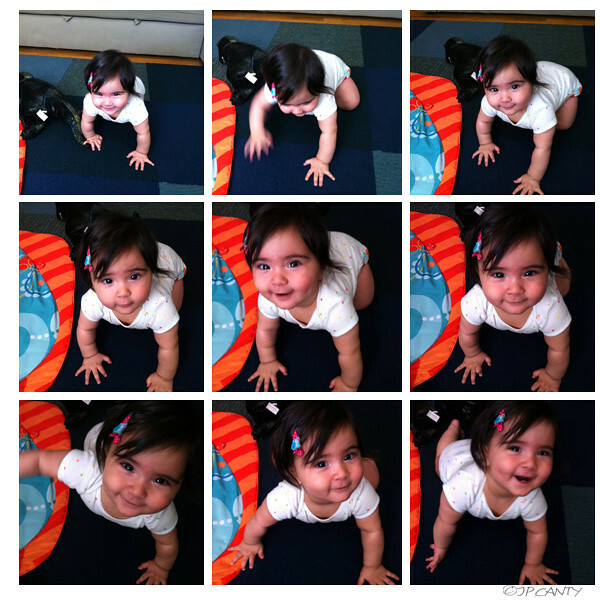 And then, about two seconds after she started crawling she started pulling herself up on stuff. The couch, tray tables. She's even tried pulling herself up on my pilates ball, which she has decided (by the way) is also the ULTIMATE toy. We have hardwood floors throughout the house. And dogs. To that end, we bought some FLOR carpet tiles for our living room, where we spend most of our time. This is Genevieve's play area. The plan, which is busy paving roads that lead to predictable places, is to do a deep-clean on the floors, do some serious de-cluttering, and repair some of the rough spots before we let our fearless DangerMouse explore. You know, once she's a little more stable, and I'm not all "OHMIGOD! DON'T PUT THAT IN YOUR MOUTH!" I've been working on teaching her the "lava" game- you know, the one where you have to stay in one place because past the boundaries the floor is LAVA! Jasmin: Pick up Genevieve. Put her in the middle of the rug. Genevieve: Pretend to find a toy. Drop toy and dash to the edge of the rug. Repeat until Genevieve gets hungry, tired, or needs to freshen up. I'm pretty sure catch-and-release is how I'm going to lose the baby weight. Or at least, how I'm going to justify all that homemade ice cream I'm eating. And do you manage to keep the dogs off the rug? Or have you decided that no, dog hair and dirt is by no means dangerous for Dangermouse, on the contrary, dirt will improve her immune system? My dog is a sucker for any textile surface to lie on. Lay out a blanket on the floor for you to sit on without covering youself in fur and he will be like "Why thanks! Awfully nice of you!" and lie down on it. I think, for my daughter, who has a couple of months ahead of her before she'll crawl, I'll just go with the immune system theory. We try to keep the dog hair away but you know...it's there and it's not going anywhere. She'll be ok with dirt and dog hair...it will help her immune system. :) She looks so cute! Enjoy the few cuddles you get...because once they start walking...they are few and far between. Put your roller skates on now that she is on the move!! I loved this stage although it can get tiring and little else gets done. She is gettting cuter by the day!!!!!!! Love that smile ! Lol.... Let the games begin- you thought your knitting time was limited before! That grin and sparkle in her eye says "Just wait Mom you haven't seen anything yet!" She is adorable! She will be just fine. My Mom always said relax they will be fine. She is gone now and she was right. After 7 grandchildren I realize we were just too uptight. Let her explore thats how she learns. I personally believe, the catch and release will work. She will learn to stay saf. :)ely on the rug, but how fun is that? Enjoy each stage because it goes by so incredibly fast. It may not seem like it now, but trust me...my babies are 19 and 22 and it feels like they should still be Genevieve's age.